You really can’t have it all, or so Devin Sutton is finding out fast. Returning to Clover was all part of his plan to exact revenge on the town that robbed him of nearly a decade of his life. Unfortunately, things quickly begin to crumble when he’s forced to choose between rekindling an old love or destroying the town. Walking the fine line between both might just end up leaving him with nothing. 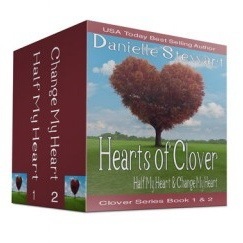 Hearts of Clover – FREE!